Sony released the trailer for the upcoming Slender Man movie on Wednesday and there has been backlash, which was expected. Bill Weier, father of Slender Man attacker Anissa Weier, says that Sony Pictures is trying to capitalize on a tragedy by releasing this horror thriller about Slender Man. Anissa Weier is one of two Wisconsin girls who brutally attacked their classmate to please the fictional horror character. Weier and Morgan Geyser lured Payton Leutner into a wooded park outside Milwaukee in 2014. Geyser is accused of stabbing Leutner 19 times while Weier cheered her on, according to investigative reports. Leutner survived after she crawled out of the woods, where a passing bicyclist found her. Bill Weier broke his silence regarding the Slender Man movie after the trailer was released online and he is obviously upset about it. The real-life attack occurred in 2014, when all three of the girls were 12-years old and the case is still in court. HBO made a documentary about the incident, which was released early last year and it goes into shocking detail about the bizarre case. The incident is still fresh in the minds of all involved and Bill Weier says that releasing the movie now is distasteful. He explains. "It's absurd they want to make a movie like this. It's popularizing a tragedy is what it's doing. I'm not surprised but in my opinion, it's extremely distasteful. All we're doing is extending the pain all three of these families have gone through." Alissa Weier and Morgan Geyser told investigators that they had to kill Payton Leutner to prove to the Slender Man that they were worthy of being his loyal servants. In addition, they had to kill her to protect their families from the villain. Geyser, now 15-years old, pleaded guilty to attempted first-degree intentional homicide in a deal with prosecutors, who have asked she get at least 40 years in a mental institution when she's sentenced next month. Weier, now 16-years old, was sentenced to 25 years in a mental institution last month after pleading guilty to attempted second-degree intentional homicide. 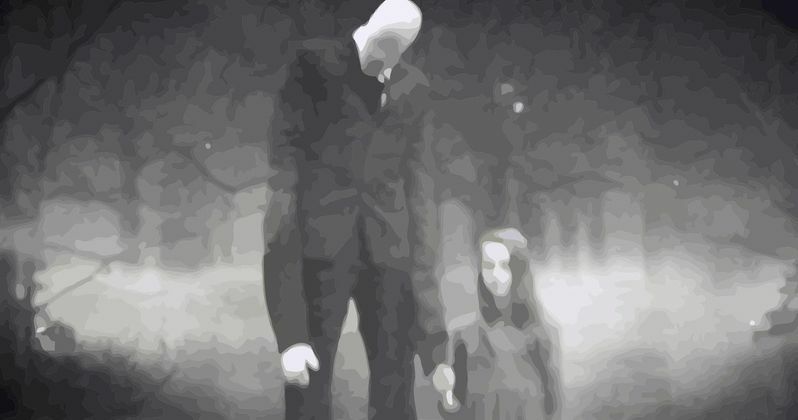 Slender Man was created back in 2009 for a Photoshop challenge to make something horrifying. Eric Knudsen, under the username "Victor Surge," shared two photos he created in which he took pictures of children and pasted a figure into the background that wore a suit, had no face, and had extremely long limbs. The fictional horror character took on a life of its own after multiple users took the original drawings and expanded them. Some even went as far as to make a backstory for the character, which led to popular mobile and online horror games. Sony released a trailer for the Slender Man movie on Wednesday morning and in one scene, a wall is covered with drawings of Slender Man that closely resemble sketches Morgan Geyser drew. Other disturbing scenes depict a girl stabbing herself in the forehead with an x-acto knife and the Slender Man stalking a young girl in the woods. The girl emerges from the woods in front of the police with some weird dark wounds around her mouth. The timing does seem to be peculiar for a Slender Man movie, especially since the real-life incident that nearly resulted in the death of a 12-year old girl is still being tried in court. You can check out the trailer for the Slender Man movie below, courtesy of IGN's YouTube channel.